A service bureau is a company that provides business services for a fee. The term has been extensively used to describe technology-based services to financial services companies, particularly banks. Service bureaus are a significant sector within the growing 3D printing industry that allow customers to make a decision whether to buy their own equipment or outsource production. Customers of service bureaus typically do not have the scale or expertise to incorporate these services into their internal operations and prefer to outsource them to a service bureau. Outsourced payroll services constitute a commonly provisioned service from a service bureau. Did they develop their own platform or license or purchase it? To its customers, a service bureau offers a combination of expertise in technology, process and business-domains. The bureau business model depends on the ability to productize services and deploy them in volume to a large customer base. In the modern context, technology often becomes a key enabler to achieving this scale. Data processing service bureaus were opened by IBM in 1932, first just in major USA cities, then internationally. The purpose was to provide access to then-state-fo-the-art Tab Equipment rather than own basis. 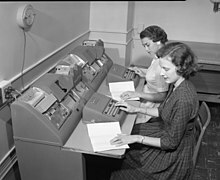 Keypunching (a term that long-preceded "data entry") was often part of what was offered. As Batch processing systems replaced Tab Equipment, service bureaus could offer this too. A few decades later, sharing of mainframes via Timesharing was a step forward. These concepts already existed - advertising and Ad agencies. Initially newspapers sold space in bulk to print space brokers; they resold the space, but individual customers made their own ads. Subsequently, the concept of having someone else write your ad took over. A specialized service bureau might be good at doing direct mail, perhaps just for a single target. Founded in 1866 as an Ohio business forms printer, in 1927 they began to specialize as printers of accounting forms for car dealers. In the 1960s they added dealership computer services. Although Landart Systems, Inc (LSI) opened in 1973 as a DECsystem-20-based timesharing bureau that also did computerized typesetting, it was the 1977 introduction of the Xerox 9700 high-end laser printer which was Landart's subsequent mark of distinction. Founded by John Gilmour, a data processing manager whose Wall Street employer folded, the initial goal was to have the various services needed to perform typesetting, financial computer graphics, word processing and general timesharing under one roof. Laserlink and another specialty, electronic publishing (which was then uncommon) allowed Landart to advance. ^ "...services to the financial service companies (particularly banks)." "Solved: Chapter 15 Problem 1P Solution". ^ Halterman, TE (26 June 2015). "Buy a 3D Printer or Use a Service Bureau? - Sculpteo Runs the Numbers". 3dprint.com. Retrieved 26 February 2018. ^ Steve Cohen (June 15, 2016). "Service Bureau vs. HCM Technology Provider". ^ Timothy Sipples. "Mainframe - Did the U.S. Government Kill Cloud Computing Over 50 Years Ago?". ^ "early punched card equipment: 1880–1951" (PDF). ^ "...estimating batch processing charges at service bureau sites." "Use of synthetic benchmarks for estimating service bureau charges". ^ IBM's ad was headlined: "This man is sharing a $2 million computer"
^ "The Pennsylvania Center for the Book - First Advertising Agency". ^ "Early American Advertising (Pre 1900's)". ^ e.g. car buyers. "Bob Brockman". ^ a b "Printing System Developer won't be Type Set". Hardcopy. January 1983. ^ "The company, Landart Systems, is offering LaserLink, an interactive timesharing service that combines high-speed Xerox 9700 laser printing, graphics "Laserlink (Landart)". InfoWorld. March 14, 1983. p. 31. ^ "The Laserlink service consists of the Xerox 9700 Electronic Printing System with ..." "Interactive Printing Service Combines Xerox 9700, T/S System Formats". Computerworld. November 22, 1982. p. 51.